A drought on the scale of the legendary Dust Bowl crisis of the 1930s would have similarly destructive effects on U.S. agriculture today, despite technological and agricultural advances, a new study finds. Additionally, warming temperatures could lead to crop losses at the scale of the Dust Bowl, even in normal precipitation years by the mid-21st century, UChicago scientists conclude. The study, published Dec. 12 in Nature Plants, simulated the effect of extreme weather from the Dust Bowl era on today's maize, soy and wheat crops. Authors Michael Glotter and Joshua Elliott of the Center for Robust Decision Making on Climate and Energy Policy at the Computation Institute, examined whether modern agricultural innovations would protect against history repeating itself under similar conditions. "We expected to find the system much more resilient because 30 percent of production is now irrigated in the United States, and because we've abandoned corn production in more severely drought-stricken places such as Oklahoma and west Texas," said Elliott, a fellow and research scientist at the center and the Computation Institute. "But we found the opposite: The system was just as sensitive to drought and heat as it was in the 1930s." 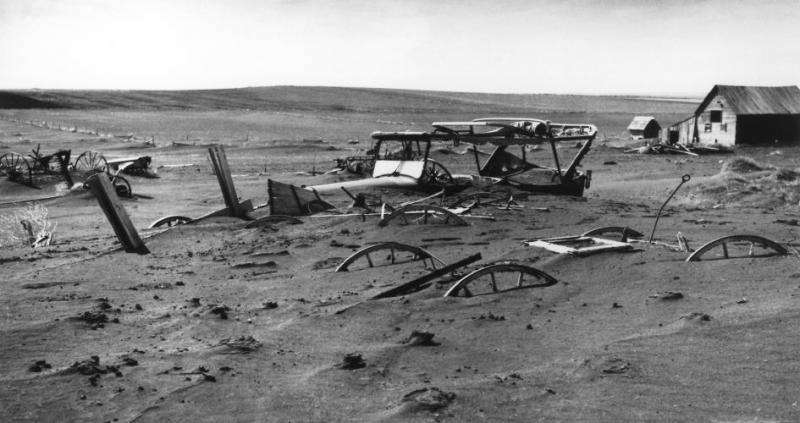 The severe damage of the Dust Bowl was actually caused by three distinct droughts in quick succession, occurring in 1930-31, 1933-34 and 1936. From 1933 to 1939, wheat yields declined by double-digit percentages, reaching a peak loss of 32 percent in 1933. The economic and societal consequences were vast, eroding land value throughout the Great Plains states and displacing millions of people. In the eight decades since that crisis, agricultural practices have changed dramatically. But many technological and geographical shifts were intended to optimize average yield instead of resilience to severe weather, leaving many staple crops vulnerable to seasons of unusually low precipitation and/or high temperatures. As a result, when the researchers simulated the effects of the 1936 drought upon today's agriculture, they still observed roughly 40 percent losses in maize and soy yield, while wheat crops declined by 30 percent. The harm would be 50 percent worse than the 2012 drought, which caused nearly $100 billion of damage to the U.S. economy. "We knew a Dust Bowl-type drought would be devastating even for modern agriculture, but we expected technological advancements to mitigate those damages much more than our results suggested," said Glotter, a UChicago graduate student in geophysical sciences. "Technology has evolved to make yields as high as possible in normal years. But as extreme events become more frequent and severe, we may have to reframe how we breed crops and select for variance and resilience, not just for average yield." The forecast grew even more dire when the researchers looked at the effect of elevated temperatures on U.S. crop yields. An increase of four degrees above today's average temperatures—a possible scenario by the mid-21st century—doubled the effect of a 1936-level drought, reducing crop yields by as much as 80 percent. Even under non-drought years with normal precipitation, the hotter weather produces declines in crop yield as severe as those experienced during the Dust Bowl. "By mid-century even a normal year in precipitation could be as bad as what we saw in 1936," Elliott said. "And a year with even a 10 to 20 percent loss of precipitation becomes extraordinarily damaging." Strategies to avoid these agricultural crises and their severe ripple effects for global food security could include switching to more drought-resistant crops such as sorghum, moving wheat, soy and maize agriculture to northern U.S. states, or developing new strains of crops with higher heat tolerance. But none of these preventative efforts are cheap, and they may be impossible for developing countries to implement, the authors said. "Reducing emissions will be critical to avoiding some of the worst damages from extreme weather in a changing climate," Glotter said. "But even in the best case scenarios, climate change is expected to alter the severity and frequency of future droughts. Understanding the interactions of weather extremes and a changing agricultural system is therefore critical to effectively prepare for and respond to the next Dust Bowl." What caused all that "dust" was out-of-control wind erosion. I grew up in the heart of the dust bowl. My father farmed through it. The problem in those days was that most farmers were using draft animals to pull mechanical implements. Once a small area of a field began to "blow", the airborne dust would have a sand blaster effect, causing the area of "blowing" to spread. As a boy I often saw fields begin to "blow". My dad would fire up the tractor, hook on to an implement called a disc, drive to the affected area, and work giant figure eight designs all around the blowing ground. This would effectively shut the process down even in drought conditions and high velocity winds. If the farmers in the 30s had had tractors and could afford the diesel like we can today, there would have been no dust bowl. That being said, erosion is relentless, and no-till and low-till methods of farming should be brought into use as soon as possible for a variety of reasons beyond erosion control.